Are you looking for a Sun Lakes Realtor? Selling a home in Sun Lakes requires the knowledge and skill of a local Sun Lakes Realtor with a proven track record. Anyone can write a listing agreement and place a “For Sale” sign in the yard. But, if you want to get the best marketing strategies, leveraging both online and traditional print advertising, this blog is for you! The Kolb Team has been selling Sun Lakes real estate since 2010. We know the real estate market so well because Sun Lakes is where we live, work and play. It is important to hire a realtor to represent you that is actively involved in the community and knows the inside scoop. Equally important to consider is the marketing strategy. The National Association of Realtors says that 95% of people looking for home start their search online in the comfort of their home. That’s a staggering percentage, so it is important that the Realtor you hire knows how to market online. That means having a website that ranks on page 1 of Google. Think about your own Google searches. Do you go to page two, three, four or beyond? Most likely, you select something from page one of your search. So, if the Realtor you hire doesn’t rank, then they have no traffic, and that means your home will not been seen in their marketing. For example, Go to Google, select “videos,” and then Google “Sun Lakes Realtor” or “Sun Lakes Listing Videos,” and you will see if your Realtor shows up there. The Kolb Team ranks heavily and that is how your home is seen by the masses searching online. We all want to push the market, right? It is the Realtor’s job to get you the most money that they can when listing your house. You need someone local that knows that the market will bear. 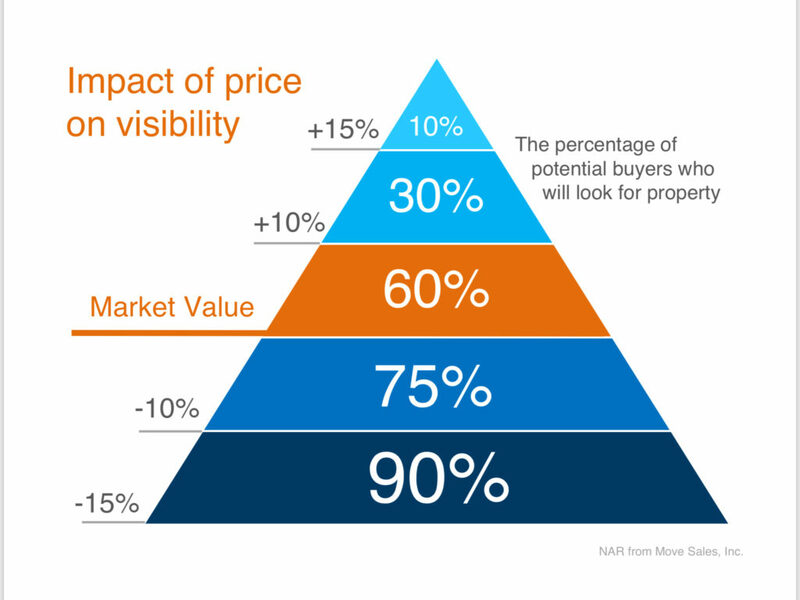 Price, location and condition are the three key factors when pricing a home to sell. If your home backs to a major road, your value will be reduced over a home that has no road noise. Conversely, if you have a golf-course lot home with water views and no nearby cart path, your value is at the high end of the range. The Kolb Team knows how to price homes in the Sun Lakes market. Clients have written reviews about our ability to push the price, and sell their homes when other Realtors come in low because they don’t believe in the market or don’t understand the trends in our area. Resist the temptation to overprice above the high end of the range. The chart indicates the pool of buyers for a home that is priced within market ranges. Look what happens when it is overpriced just 10%. Your audience was just cut in half. No showings means no offers. The market tells us the value of a home. We listen to the market – the buyers. And we know and sell the value of your home. Ready to hire a Sun Lakes Realtor? If you are ready to discuss listing your home for sale in Sun Lakes, AZ, contact us here, or call us at 480-440-0849. We will be happy to demonstrate our listing package and marketing strategy.